student-led projects aimed at solving problems that matter to this generation. By encouraging novel proposals and then supporting concrete next steps, Big Ideas is helping contest winners make an impact all over the world. 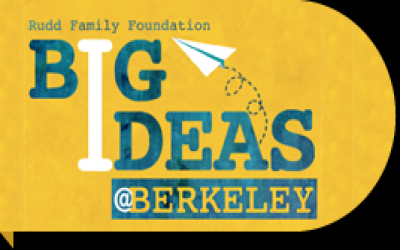 Eligible students are invited to submit a five-page pre-proposal by Thursday, November 13, 2014 at 12:00 Noon (PST) via the bigideas.berkeley.edu website. Judges will select 3 to 6 teams in each category to continue on to the full proposal round of the contest in the spring. All pre-proposal teams will receive detailed feedback from the judges, regardless of whether or not they are selected as finalists. Pre-proposal entrants will be notified the mid-December 2013 if they have been selected as a finalist. Finalist teams will have the opportunity to develop and refine their pre-proposals into ten-to-fifteen-page “full proposals” due on March 10, 2015 at 12:00 Noon (PST). In this full proposal, finalists will expand on the ideas presented in their pre-proposals, edit their proposals based on judges’ feedback, and refine their project ideas through collaboration with a Big Ideas mentor (a Bay Area industry professional matched to the finalist team based on the mentor’s content knowledge and areas of strength). From the finalist pool, judges will select between two and five award winners in each category. People’s Choice Video Contest: All non-finalist and finalist teams will be invited in the spring to submit a two-minute video about their project to the People’s Choice Video Contest. Voting for this contest is open to the public, and one winner will receive a $2500 award. Grand Prize Pitch Day: Select finalist teams will be invited to attend the Big Ideas Pitch Day in May 2015, where teams will pitch their project ideas to a panel of judges. Judges will then select Pitch Day winners to receive an additional award.